Welcome to our first official write-up of one of our dinners! 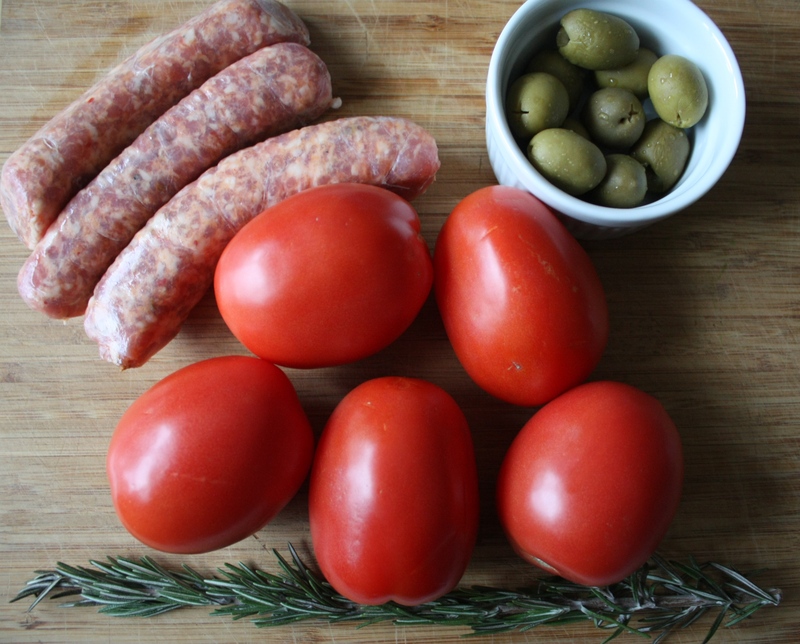 Tonight we made Pasta With Spicy Sausages, Tomatoes, Rosemary and Olives. This is a perfect weeknight meal. There are only seven ingredients: the four in the photo above, plus olive oil, garlic, and pasta. Even better, it’s a very flexible recipe. 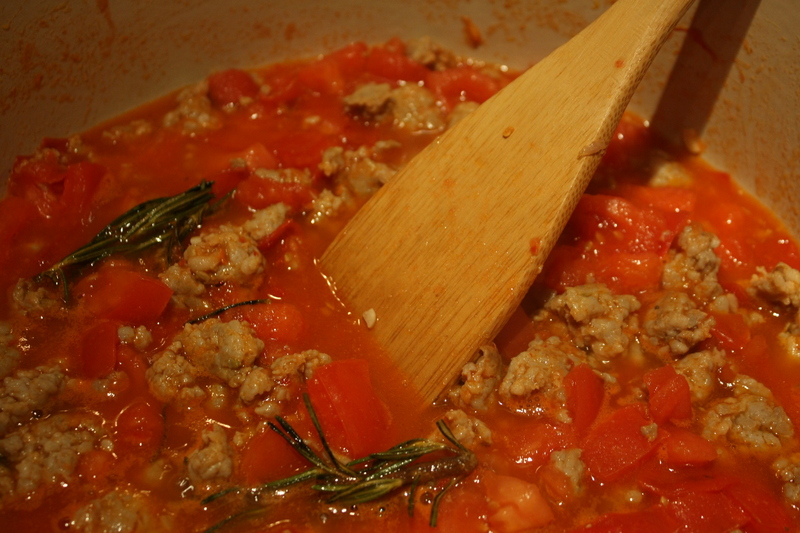 It calls for spicy sausage, but you can use sweet. You can probably leave out the olives if you don’t like them. We love rosemary, so we wouldn’t skip it, but you could. 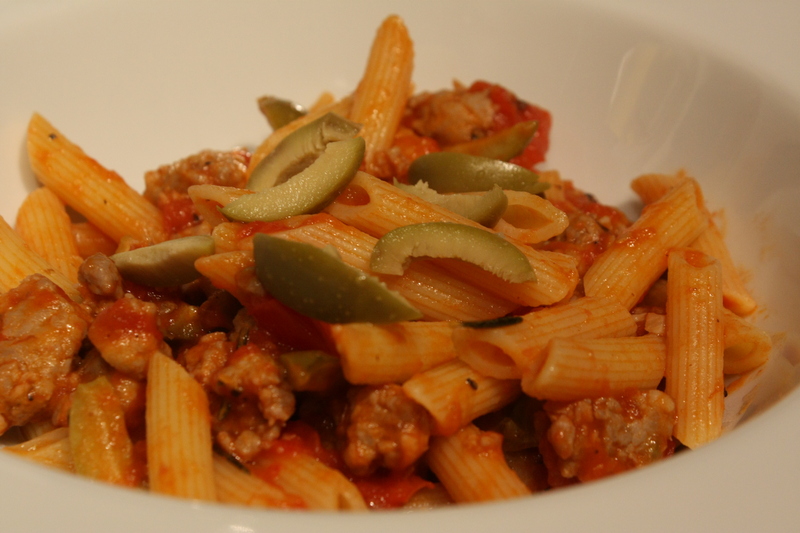 The first time we tried this dish, we used whole wheat pasta – and learned that we really don’t like whole wheat pasta! The only change we made to the recipe was to cut the rosemary sprig into four pieces. We figured this would make it easier to work with (it did) and get more rosemary flavor into the dish (it seemed to do that too). The only issue we had while cooking is that the sauce didn’t seem to be thickening up very quickly. 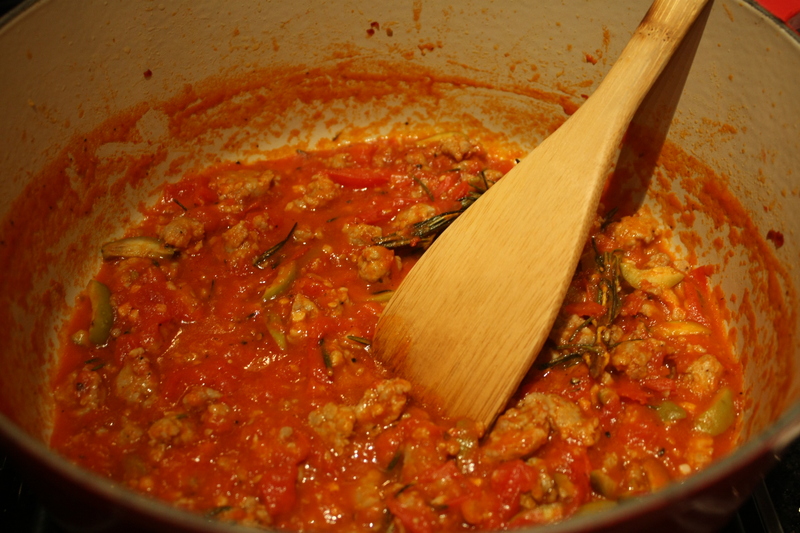 We added about a tablespoon of tomato paste and raised the heat a bit, which did the trick. As far as consistency, you’re going to go from the photo on the left below, where the tomatoes have released a lot of water, to the one on the right, where the water has mostly cooked off. This dish was as good as we remembered. Every bite was infused with rosemary and burned with just enough heat to keep things interesting. We paired this with a bottle of Chianti Classico for a simple but enjoyable weeknight meal.